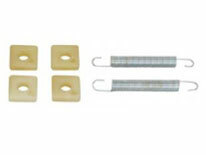 Replacement Washing Machine Glide and spring repair kit used on some Whirlpool, Jenn Air and Maytag brand washing machine models. 205000, AP4023752, 204998, 2-11952, 2-4998, 2-5000, 211952, 2791, AH2017149, EA2017149, J28-652, LP921, PS2017149, Y204998, Y211952. Motor spring and glide kit rebuilds motor roller assembly on most automatic washers. Includes springs, lubricant and rollers.